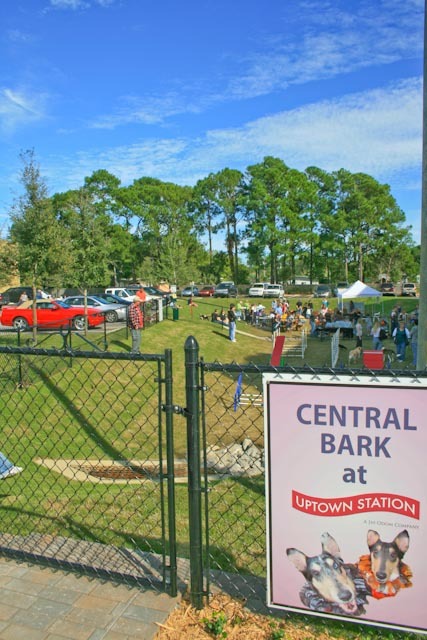 Central Bark – Uptown Station’s off-leash dog park. Welcome to Central Bark, Uptown Station’s special and exclusive Pet Park. When we created J G Plaza at Uptown Station, we saw that we had an area that could just be grass which would be great for people, or we could build a park just for the Uptown Station puppies! So, here is Central Bark, a fenced area where dogs can hang out and do what they like to do. We have fenced the whole area, and there are two separate areas, so if needed we can have a ‘big dog’ and ‘little dog’ area, or we can hold an event in one half and let puppies just play in the other. There is a water spigot and dog bowls for fresh clean water; play equipment for those inclined to exercise, and plenty of grass to run and play on. We have trash containers and bags for those little ‘personal’ moments our puppies have, and Central Bark is regularly cleaned an maintained. We’re also planning events, and obedience and agility lessons. Let us know what you’d like to see? Come and bring your puppies to Central Bark. WOW!!! super news, thanks so much. Ft Walton needs as many pet friendly areas as possible and has long needed a dog park. Exciting, will visit soon and pass on the good news! Oh so cool. Is it open now ? I am interested in obedience classes. The park is open every day, although there are no obedience classes planned during the summer. We are waiting for Pet Supermarket to open, when there may be some events and classes planned. Do you have anything planned for Halloween? I would love to see a bark or treat for the dogs to dress up in their costumes and trick or treat for bones. slab or something that levels it with the ground. out free running through the busy parking lot. She got into a fence in the adjoining homes. go back until I’m sure she can’t slip out again. Awesome. I’ve been looking for a dog park because I need to socialize my dogs. Im also looking for obedience schools also so if you start offering that I would be interested in finding out more. My dogs listen at home, but they need to learn to listen around other people and dogs when away from home.